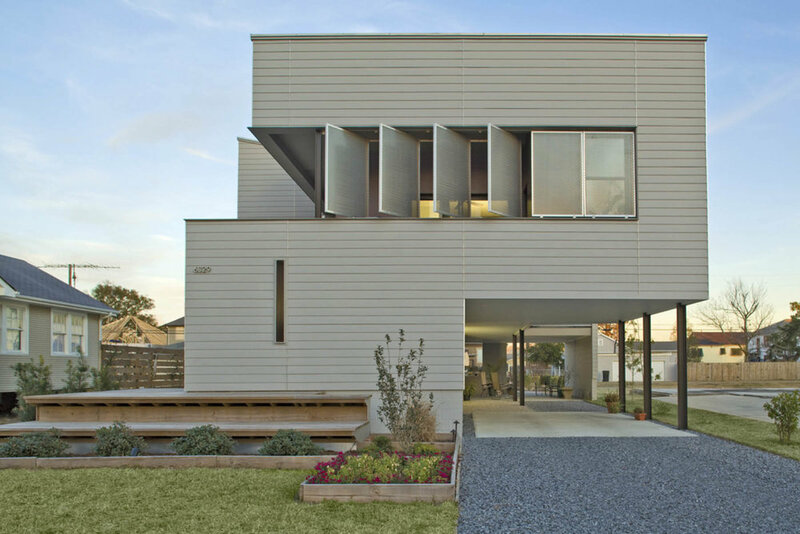 in new orleans’ lakeview neighborhood, this residential project rises up to make a bold statement with a modern response to replacement housing for the suburbs. 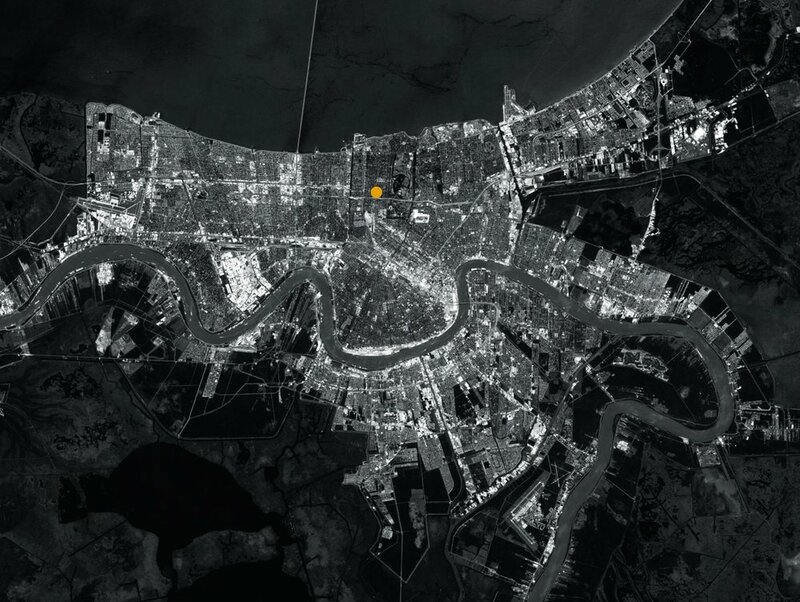 this post-katrina project replaces a devastated family home with a creative and contemporary response to the problems of their low-lying area. 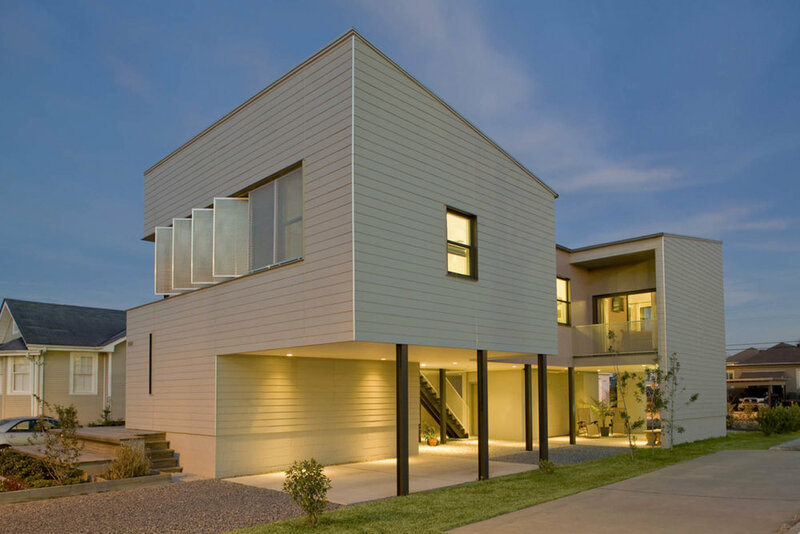 its design affords protection from the threat of high water while it simultaneously reinforces the social and cultural ties of the home’s occupants to the ground and the surrounding community. elevated in anticipation of future flooding, this single-family residence capitalizes on the underside of the home. in a departure from the common response of simply building on stilts, this project makes use of a combination of steel columns and concrete block walls that support the dead weight of the raised home, serve as lateral bracing, and allow for the differentiation of a series of ground-level outdoor rooms, which function as grilling and entertaining spaces. as an extension of the living area, these covered outdoor areas offer an intimate and efficient connection between home and ground and make this underside space a crucial component of the home’s design. further reinforcing the link between the house and its surrounds, the traditional front stoop–significant both socially and culturally in new orleans–is also reinterpreted and, in fact, exaggerated. 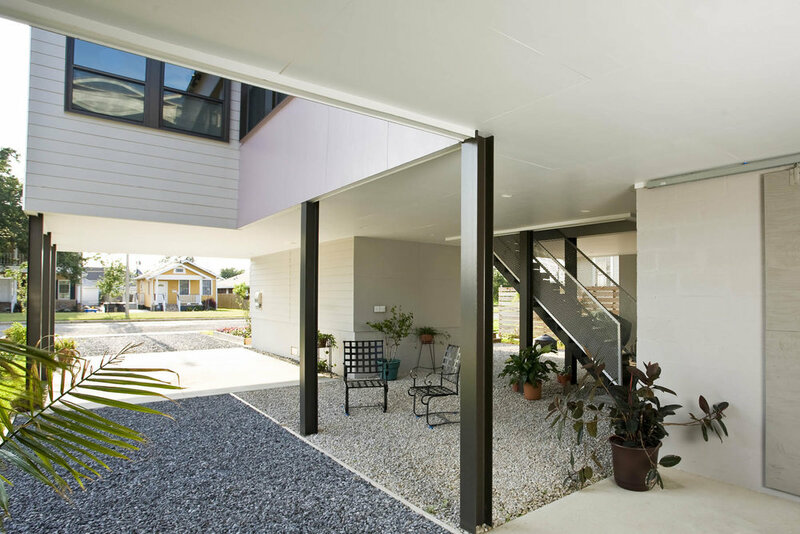 while visitors are welcomed via this reinvented stoop, the homeowners primarily utilize the covered underside access. 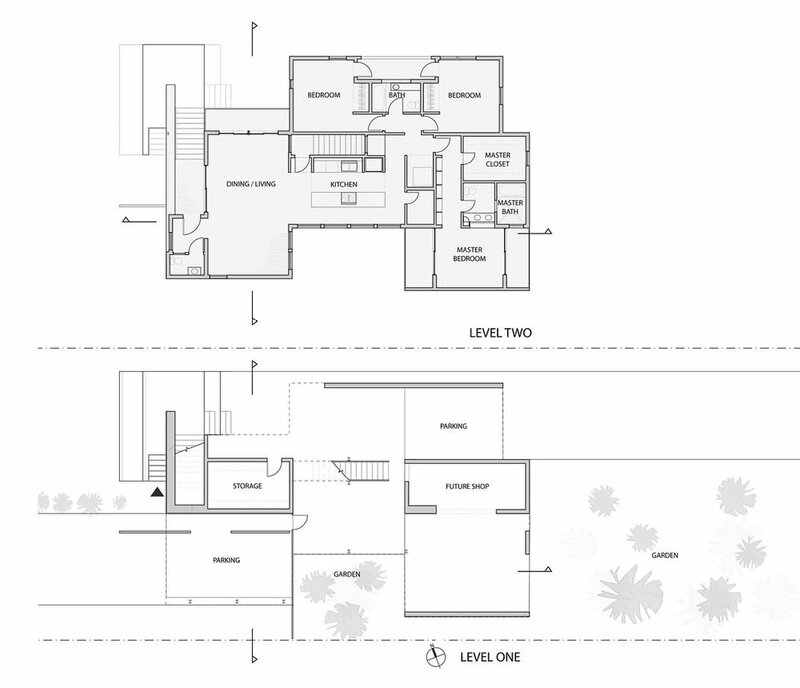 a central stair core connects the outdoor garden rooms with the upper kitchen and living areas. the building’s enclosure utilizes thermally insulated aluminum windows, cementitious fiberboard clapboard, and metal roofing. exterior ground cover combines solid and permeable surfaces to compliment the domestic activities and aid with site drainage. with greater investment in exterior spaces, detailing of the home’s interior makes creative use of common, off-the-shelf finishes and fixtures. design for the second-level space further blurs the threshold between inside and out by providing covered balconies off of many interior spaces. while the home is distanced from the ground, decks adjacent to the combination living/dining area and each bedroom provide additional opportunities for enjoying life outdoors; a custom shutter system on the entry facade offers protection from the western sun.